Notion studied by Abel, Jacobi, Riemann and Clebsch (who named it). The genus of a connected surface (i.e. 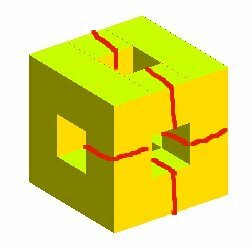 a connected topological space any point of which has a neighborhood homeomorphic to the plane) is the maximum number of simple closed curves without common points that can be traced inside this surface without rendering the resultant manifold disconnected (i.e. such that the complement of these curves remains connected); in concrete terms, if we consider that the surface is made of paper, then the genus is the maximum number of closed cuts that can be carried out without the surface being decomposed into several pieces. This notion is topological: two surfaces with different genuses are not homeomorphic. 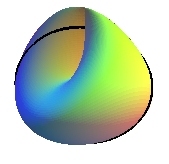 the sphere is of genus 0: any simple closed curve disconnects it, while the torus T is of genus 1: a curve can leave it connected, but two curves with no common point disconnect it. while the Klein bottle K is of genus 2 (and not 1 like it can sometimes be read); the two curves above leave the bottle connected. 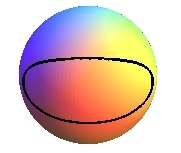 The genus characterizes the orientable closed surfaces, since the n-torus:Tn is of genus n and characterizes the non-orientable closed surfaces, since the sphere with n cross-caps is of genus n.
g = 2 - c for a non-orientable surface. A closed surface in which have been drilled a finite number of holes (open or closed, and homeomorphic to the disk) keeps its genus (whereas the Euler characteristic is modified). 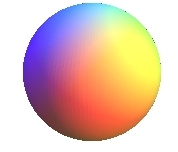 - the plane (sphere minus a point), the cylinder, with or without boundary (sphere with 2 holes), are of genus zero. 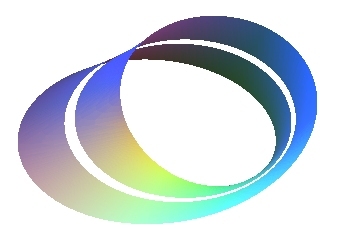 - the open or closed Möbius strip (projective plane with one hole) is of genus 1. 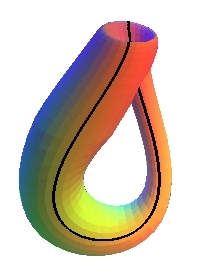 Cutting a Möbius strip at its center does not disconnect it; its genus is equal to 1.
the 5 red curves do not disconnect it; a sixth would.